Initially we determined the design envelope and the unit layouts to maximize amenity, views, ventilation, solar access and efficiency. 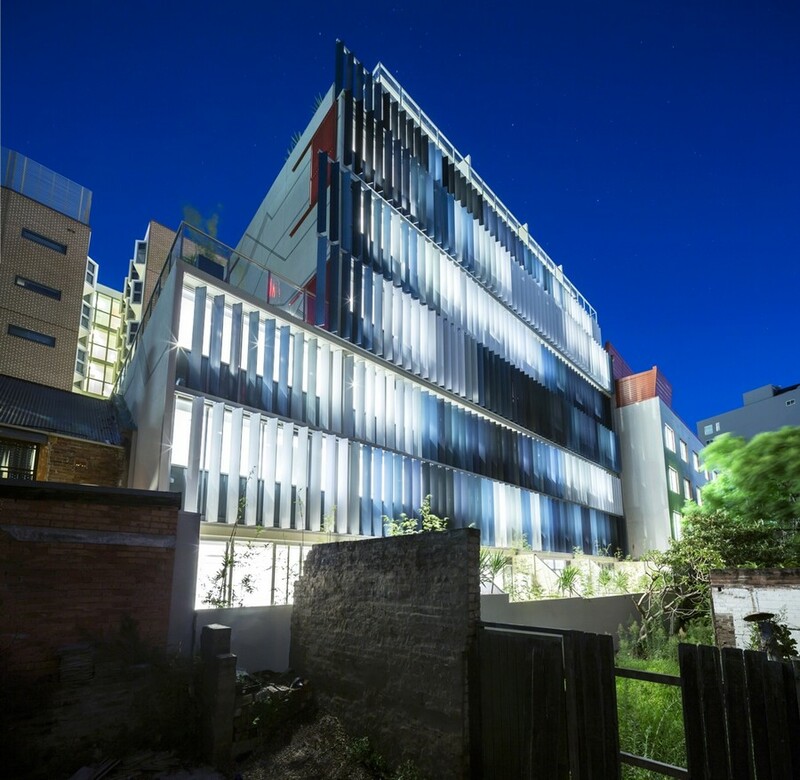 The 2 principle facades faced entirely different issues, The eastern façade is in close proximity to adjoining apartments and contains the principle living areas for solar access. This façade has a fully operable façade with a combination of glass, silver metal and red metal louvers to control privacy. The west façade contains bedrooms and circulation corridors. We used vertical louvers here to control western sun. This is the art wall. Vertical louvres of varying colours and textures create a pattern on the eight-storey facade that is discernable only from a distance. Up close it’s just a part of the colour of the city, by when viewed from afar a distinct image emerges of fabric flowing in the breeze. Five visual concepts were trialed, including the face of a Kate Blanchette. In a unique approach, the final image was chosen from an on-line poll of various options to allow the public to decide the streetscape of their city. Some Council officers even registered their preference, with the abstract fabric design being judged more appropriate than the graphic of the attractive blonde, the floating clouds, the cityscape and the CBD skyline. The interiors are bold, with colourful tiles, geometric-patterned wallpaper, exposed storage options, modular joinery, and kitchens designed as large pieces of furniture to maximise the space. The latest building by Tony Owen blurs the line between architecture and urban billboard. Work has commenced on the EDEN apartments in Sydney. This infill project is located in a varied and complex part of the Sydney cityscape and is visible from many vantages. The office sought to explore the possibilities of adding to the tapestry as a piece of art in the urban landscape. In a unique approach, the final image was chosen from an on-line poll of various options to allow the public to decide the streetscape of their city. Five visual concepts were trialed, including the face of a beautiful woman, and subjected to an on-line vote on architect Tony Owen’s website. Some Council officers even registered their preference, with the abstract fabric design being judged more appropriate than the graphic of the attractive blonde, the floating clouds, the cityscape and the CBD skyline. Eden will have 24 apartments in a diverse mix of layouts, from one to three-bedrooms. The two-storey configurations may have their roots in a traditional Victorian terrace but these have evolved into modern habitats with high ceilings, dramatic voids, double-height windows and wintergardens. The vertical louvres are there for more than just show; they function for sun control, privacy, and help to modulate temperatures within the apartments. Interiors are bold, with colourful tiles, geometric-patterned wallpaper, exposed storage options, modular joinery, and kitchens designed as large pieces of furniture to maximise the space.